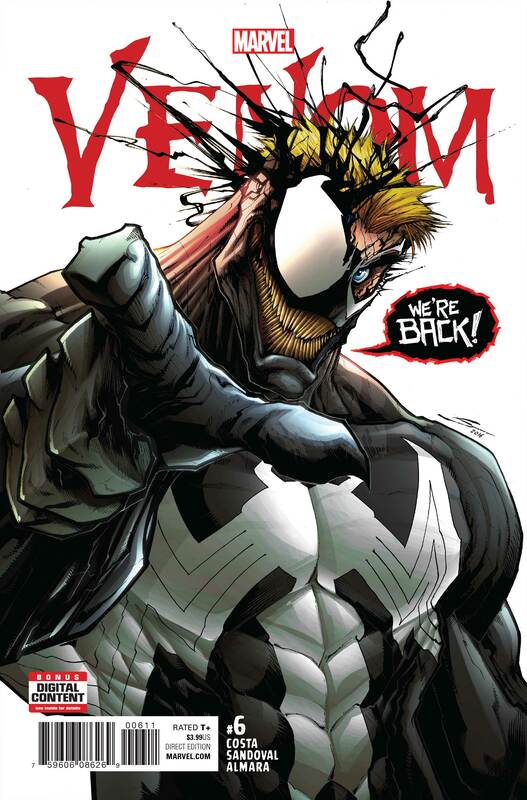 Restoring the old status quo, Venom #6 reunites Eddie Brock with his beloved symbiote! It's effectively a relaunch, and it's going to be interesting to see where we go from here. It’s time to party like it’s 1999, because Eddie Brock is back in the driving seat of Venom. The symbiote’s status quo has been as fluid as its own form over the last few years. 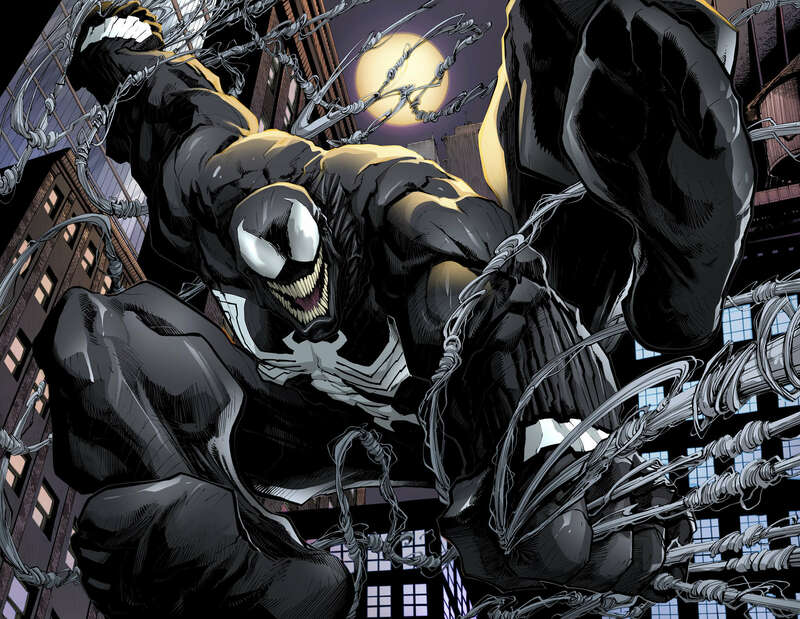 Mac Gargan was Venom for a time – even becoming a member of the Dark Avengers, and more recently, Flash Thompson became a fan-favorite as Agent Venom, even joining the Guardians of the Galaxy for a while. 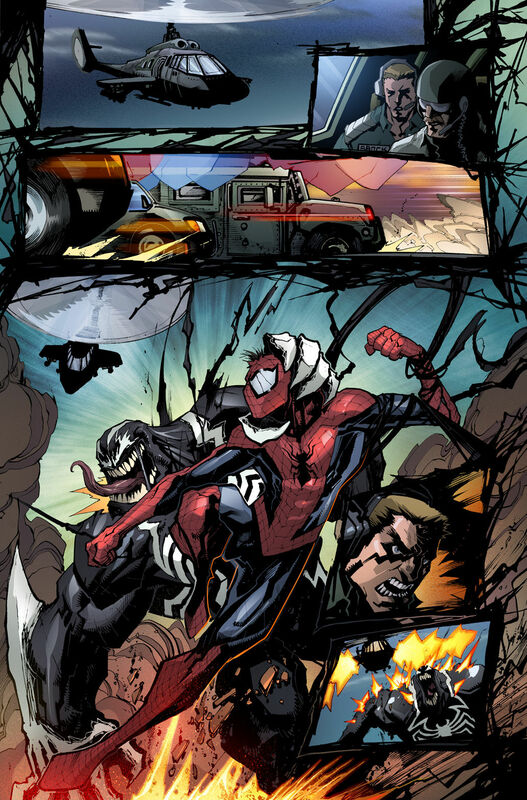 Returned to Earth, the symbiote has now found a new host – former Ranger Lee Price. Venom #6, though, is the moment when all that changes. It’s the issue where the Venom symbiote finally goes home. Mike Costa’s script is smart and savvy, and – in a delightful twist – neither Lee Price nor Eddie Brock is the main character of this issue. Rather, the symbiote is. Venom writers don’t usually trouble to understand the symbiote as a creature, but that’s the approach Costa takes; he dives deep into the symbiote’s psychology, exploring the creature’s twisted desires and frustrations. It’s a fascinating approach, and it suggests we’re in for a relaunched Venom series like nothing we’ve seen before. 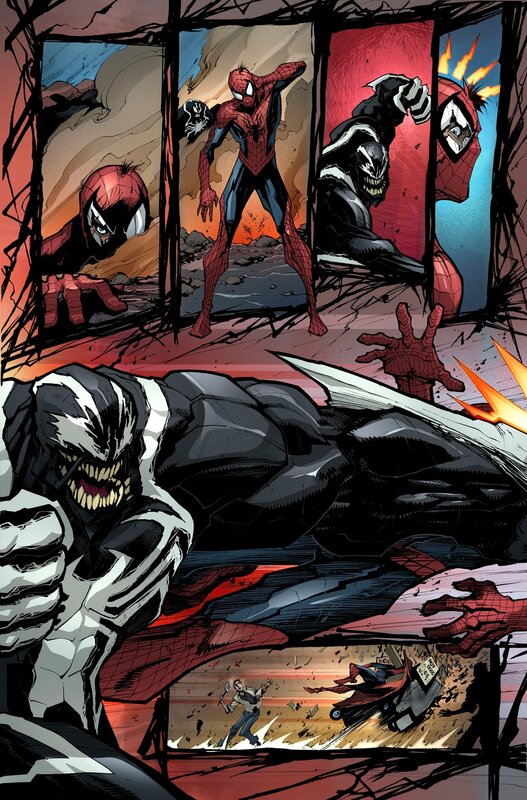 In this iteration, we’ll literally be exploring the brutal partnership between Eddie Brock and the Venom symbiote. It’s a smart move and a twist on the restored status quo that makes this issue stand out from the rest. 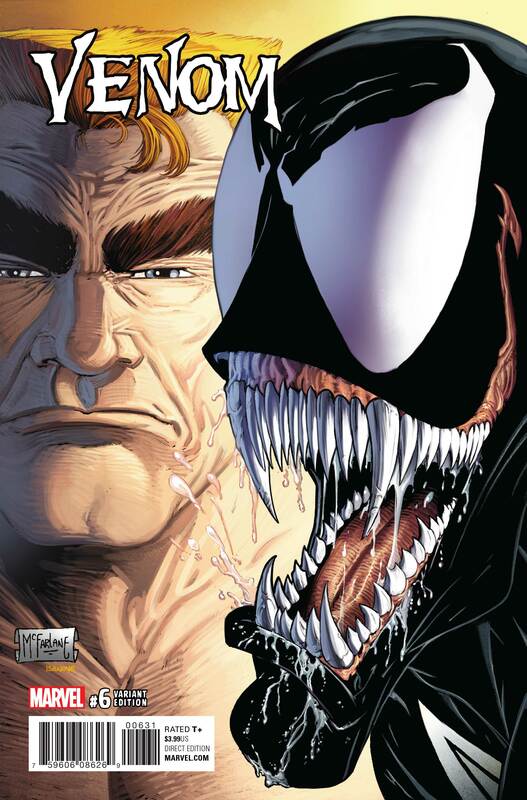 I’ve got to be honest, though, that I’m not so sure Mike Costa’s Eddie Brock is a character I’m familiar with. In truth, I’m getting a sense of whiplash when it comes to Eddie Brock, as it feels like his character is basically whatever the writer at the time wants. I can’t help remembering the religious zeal with which he pursued the symbiotes as Anti-Venom, for example; that Dan Slott really sits uncomfortably with Costa’s portrayal. Spider-Man‘s role in the issue is perfect, and Costa uses the web-slinger to inject the book with both dark humor and real, intense emotional pathos. I can’t help laughing when Eddie is told that Spider-Man has “engaged the target.” Just a panel earlier, the villain snuck up on Spidey and knocked him for six. Yup, he’s engaged the target alright. But the real emotional payoff is when Brock and Spider-Man conspire against Venom. They launch a trick that, frankly, is more than a little disturbing – one that’s sure to rekindle the symbiote’s old hatred of Spider-Man. When Peter reflects that he’s “going to Hell for this,” I can’t help chuckling. I’m pretty sure he is, and we’ll get to see it in the pages of Venom. Oh, Spidey, you’ve just breathed new life into one of the most dangerous vendettas you’ve ever experienced. Big, big mistake. Gerardo Sandoval’s art is fascinating here. He’s definitely channeling his inner ’90s, and I love the disturbing panel-designs he uses at time. Some panels are surrounded by symbiote-strands, showing that everyone in this story is enmeshed in the tale of an insane, vengeful symbiote. It’s a beautiful touch, and I find it really impressive. I love the way he draws Spider-Man, too – and pays attention to the current costume, even remembering that the eye-panels aren’t fabric anymore, so would break rather than tearing. All in all, this is a good relaunch for Venom. The character’s gone through a lot of changes over the last 20 years, but Marvel’s just set the clock back. I admit that I’m wary of that kind of nostalgia-led approach, but the reality is that Venom needed a new lease of life. This might well be what gives the book its chance to shine.